This year I was chosen as one of 100 bloggers to participate in the RAZ 2011 Program with Cepia, LLC the makers of the Zhu-niverse™ toys and MomSelect™. 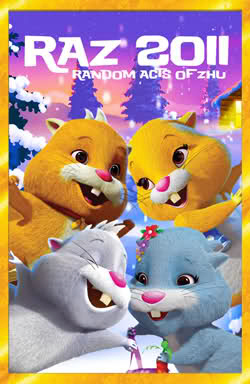 Each blogger received between 20-96 boxes of Zhu-themed toys to give to the local charity(ies) of their choice. This is the third year that Cepia has done their RAZ program and I am SO excited to have been chosen as one of the bloggers! I remembered this wonderful charity that I was introduced to at a local community event this summer called Heartbeat for Wounded Warriors, and I contacted Janice, the Founder/President to see if they could use the Zhu bundles. She was very excited and started reaching out within her network to see who had the greatest need for the toys. Janice actually had me work directly with Deborah, a Lead Family Assistance Coordinator working with the National Guard so I could get the toys to the divisions that needed them the most QUICKLY. When Deborah and I met in person, she explained that many of our National Guard members went overseas when called to Active-Duty, but when they returned to resume their normal jobs (they normally have every-day jobs during the week, and National Guard jobs on the weekend, until they are called to Active Duty), many of those jobs didn't exist anymore due to the downturn in the economy and businesses closing or down-sizing, and that many members are still having trouble finding permanent jobs. She then explained that she had plenty of families that would LOVE to receive the help of the Zhu toys for Christmas, and that she would be giving them to families that day. Filled The Back of My Van! When I think of both the RAZ 2011 program and the Heartbeat For Wounded Warriors, I will have to admit that the whole thing brought tears to my eyes more than once. Knowing the work that Heartbeat does for soldiers and their families across the US, and that they are a locally-based charity, I am so happy to have been part of their support network for a very short time. I highly encourage you to visit their website and read more about what they do and how they help families across the United States. Heartbeat—Serving Wounded Warriors provides emergency assistance, therapeutic services, support groups, and morale-building programs for wounded service members and their families in Washington state. Our focus is on the wounded and injured. Heartbeat is a private, 501(c)(3) nonprofit organization — donations are tax deductible as allowed by law. We offer our programs to wounded and injured service members from all branches of the military: Air Force, Army, Coast Guard, Marines, and Navy. Heartbeat’s programs and services for wounded warriors and their families are continually growing. We offer support for many types of needs: emergency, physical, emotional, and daily living. Read more about Why They Help and their History at the Heartbeat website. I'd like to say a huge Thank You to Cepia LLC for donating the toys, and MomSelect for coordinating and communicating about this great program! I'm truly blessed and consider this experience to have been a huge benefit to my local community, and I'm very proud to have been a part of it. *Disclosure: Cepia, LLC provided the toys for the RAZ 2011 program, and MomSelect coordinated the disbursement of the toys and all communication. I did not receive any form of communication or toys for this event, but ended up taking away the satisfaction that I got to be part of a large group of bloggers helping local communities. Welcome to week 2 of our Pinterest weekly feature, brought to you by Samantha from Have Sippy Will Travel, Staci of 7 on a Shoestring, and Wendi, here at Wendi's Book Corner: Minute To Pin It: A Weekly Pinterest Party. If you haven't checked out Pinterest, you really should! It is a visual bookmarking site that allows you to 'pin' your favorite things online, share it, and find great 'pins' from people you follow. I've found some of the GREATEST things on there (crafts, home ideas, recipes, gift ideas, fashions, tips, etc). So, grab the button, visit/follow your hostesses and add your own Pinterest link below! I don't know about you, but I always struggle with the war to not gain additional weight during the holiday season because of all the wonderful foods that our family cooks, bakes and broils to share with each other. Another thing I really struggle with (and not just at the holidays) is skipping breakfast. The Slim-Fast 3-2-1 Plan can help me with both problems! • The new Slim-Fast shakes are part of the Slim-Fast 3•2•1 Plan, The plan gives you quick results* - done right. Plus it’s flexible so you can get the structure you want and the variety you crave. Slim-Fast products are available at Wal-Mart, Target, Safeway, Kroger and online at Amazon.com and the Slim-Fast 3-2-1 Store on Facebook. See? 3-2-1 - Easy, right? Now for the best part! For someone like me who has two young boys to deal with in the morning and who regularly skips breakfast, a Slim-Fast shake is a great way to get some protein and nutrition into my morning to help fuel me for the rest of the day and to properly jump-start my metabolism. From there, it should be easy to stay on board! Check out the Slim-Fast website, where you can enter to win $10,000 in their Vow to Wow Giveaway. Stay and check out all the great tips available as well. You can also enter via the Slim-Fast Facebook Page. 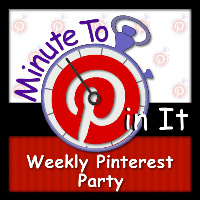 Welcome to a brand new weekly feature, brought to you by Samantha from Have Sippy Will Travel, Staci of 7 on a Shoestring, and Wendi, here at Wendi's Book Corner: Minute To Pin It: A Weekly Pinterest Party. This is a Sponsored post written by me on behalf of LG DoublePlay™ for SocialSpark. All opinions are 100% mine. My husband and I are going to be looking for new phones pretty soon, and while we don't currently have data plans, it is something we'd love to eventually add, so I'm looking for a phone that can do it ALL! My current phone has a touch screen, which I love, so I consider that to be a MUST as it makes things so much easier than trying to scroll through the menus. It also has a 2 megapixel camera, which is another MUST because we have kids... in fact, I'd LOVE a better camera. I've recently discovered the LG DoublePlay™, which DOES have a customizable touch screen. In fact it has TWO - one main screen, and one smaller screen which can be used at the same time as the main one. It also has a full QWERTY keyboard which saves a lot of texting/typing time and reduces typos (at least for me). The Doubleplay™ also allows you to check email, browse the web, and update Facebook. It also has a 5 megapixel camera with LED flash and an HD video recorder, so pictures and video can be uploaded and shared via email, Facebook and messaging. This is perfect for me because at 5 megapixels, pictures can be re-printed and shared at a much higher quality without being blurry. YEAH! The LG Doubleplay™ is an Android 2.3 phone, so it gives users access to the Android Market™ and allows lots of great user customizations (customize your phone with seven different home screens and the ability to have up to nine touchscreen shortcuts). It also has some great texting features to help make texting with one or more people easier. Both my husband and I text a lot in order to keep in touch with each other and with friends and family, so the technology available here will make things so much easier. Since the Doubleplay™ is going to make texting easier and more convenient, help me take better pictures and videos AND help me share them, not to mention allowing me to browse the internet, check email AND update Facebook, it seems to be a perfect fit for my needs. Looking for a last minute stocking stuffer, or know someone who needs a new cell phone? You might want to take a look at what the Sprint 3-Day Sale has to offer. 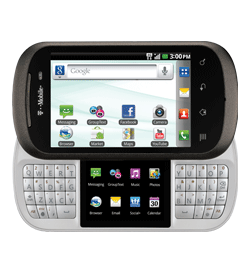 Sprint is having a great 3-Day Sale (December 12-14) on Android™ powered EVO 4G devices! Get the HTC EVO™ 4G or EVO™ Shift for FREE: http://bit.ly/rBqHmY, Plus get waived activation for new lines of service and free shipping. Hurry! The sale is available now through December 14th. Every year I face the challenge of finding a way to make our older son's Christmas Eve birthday special, and keeping it separate from Christmas. This year I am so excited... 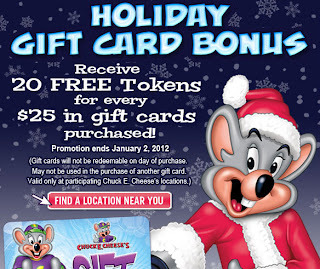 I am planning a Chuck E. Cheese birthday party - and YES - They are open on Christmas Eve! 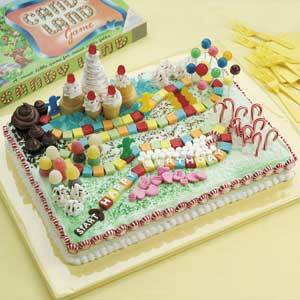 I love that Chuck E. Cheese will let us bring the cake and ice cream for the party, while they provide everything else! 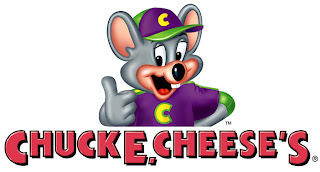 The best part about having a Chuck E. Cheese birthday party is that they always have great deals on food and tokens, and I don't have to do extra work at home to get ready for the party or to clean up!! 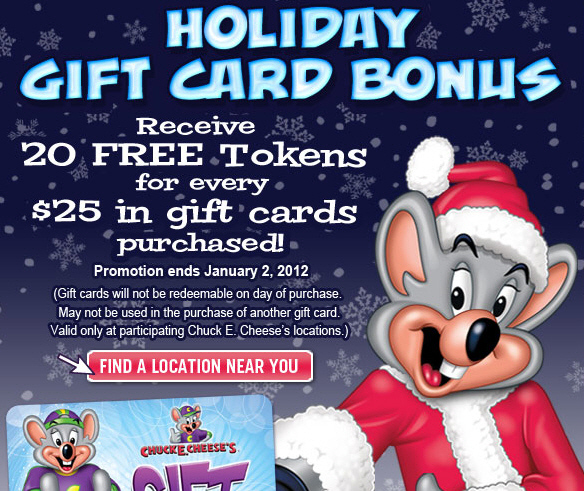 Right now, for every $25 gift card purchased at a Chuck E. Cheese location, you will get 20 tokens for free. I'm planning to go in ahead of time to purchase a bunch of gift cards to pay for the party - that way, I'll have extra tokens, plus, I reserved the party online which gives you 20 bonus tokens! It is so easy to reserve a party - I went online and reserved a Christmas Eve party at one of the locations near me, estimated the number of people coming and selected the food/party favors that I wanted. The online reservation even gave me an estimated cost for my party - it is so great! Not only are there fun games for the kids to play, there are fun picture opportunities, a great birthday show, yummy food and great party bags. 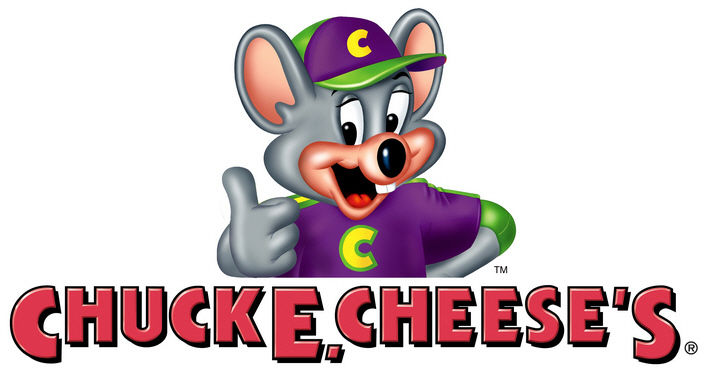 Chuck E. Cheese also has some really great online features, like their Activities page which has some great printable activities for the kids and to help with the holidays: Paper Chain Decoration, Holiday Gift List, Gift Tags, a Matching Game and a Babysitter Checklist. Plus, under the Chuck E. Games section, you can find some fun online games (you can even earn bonus tickets for use at a location by playing the Skee Ball Game), printable coloring pages, music and so much more - come check it out! Welcome to Week 36 of Finding New Friends Weekend Blog Hop hosted by Shelly from My Saving Game, Sam from Have Sippy Will Travel and Jeannette from The Adventures of J-Man and MillerBug! Thank you all for helping make this hop so successful! We love you tons! Now what are you waiting for? Let's get to hopping! We are finding some fabulous blogs through this hop and having a great time getting to know so many of you! So thank you for linking up again this week to those of you who are hop veterans and welcome to those who are new! Let's continue to make new bloggy friends and increase our traffic! We do have a few simple rules for you - nothing too tough though. So here we go! Have you experienced a soy candle with amazing aroma that inspires and makes your holidays go smooth and relaxed? Have you seen anything like waiting with anticipation what’s going to be peaking out of the hot soy liquid while the candle is still burning? If not, then Diamond Candles Company would like to invite you to Review and Giveaway their Precious soy candles. Why “precious” you’ll ask? Well, each candle harbors a ring valued anywhere from $10-$100-$500-$5000 each. It’s anticipation that really gets you going! What kind of a ring am I going to unveil from the glittery pouch hidden inside the soy wax? The Criteria for Your Participation Are Simple. This event is Free to you. Open to US only. 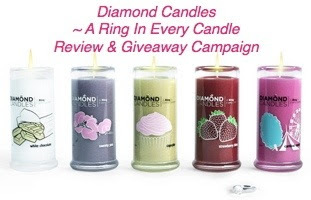 If you are to review and giveaway a product sponsored by Diamond Candles Company, you’ll need to include in your giveaway the sponsor’s Facebook and Twitter mentions, and a couple of keywords within your review. I found out about this fun opportunity on The Spring Mount 6 Pack.